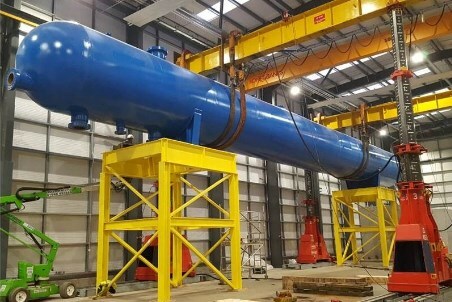 TUV SUD NEL, the flow measurement R&D specialist, has invested £1.45 million in one of the world’s largest gravity test separators, as part of the build programme for its new Advanced Multiphase Facility (AMF). The new separator will test both multiphase and wet gas flows (oil, water and gas) and will ensure sufficient retention time, even at the largest flowrates. Weighing 270 t and operating at pressures up to 150 bar, it will enable flowrates within the AMF that are 20 times greater than the performance of any other test facility in the world. This will meet the oil and gas industry’s growing demand for flow meter testing that more accurately reflects real-field conditions, to reduce measurement uncertainty and minimise fiscal inaccuracy. The £16 million AMF is designed to provide a new, best-in-class test facility, and will focus predominantly on the £50 billion/yr global subsea sector and wet gas business. It will facilitate company-led industrial projects and product development, hands-on industry training and academic research. Creating at least 17 new jobs, the centre will futureproof the delivery of innovative technical services to the oil and gas production market for the next 25 years.